What was your first fishing book? Re: What was your first fishing book? Having only just caught the book collecting bug this year, I only have around 10 books. The first one I bought was Tony Miles' "The complete specimen angler". The chapters on both Bream and Tench are very interesting. A brilliant author whos books are great reads. Last edited by Joshluke on Sun Aug 26, 2018 7:22 pm, edited 1 time in total. Fishing is not just a sport, it's a way of life. It's an escape from reality, away from the hustle and bustle of daily life. It's just you, a river, and an old Willow tree hidden away from everything. 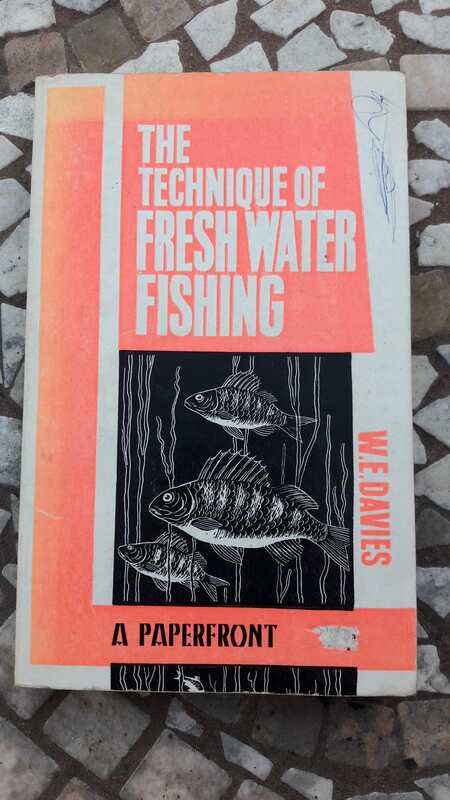 This was my first fishing book "The Technique of Freshwater Fishing by W.E. Davis Bought in 1973. I absolutely loved this book. peter wheat observers book of coarse fishing 1976 I believe. I suppose my first serious book was “Fine Angling for Coarse Fish”.Ted Ensome (“Faddist”) which is still applicable today. Fishing for Roach with Mr Cherry and Jim. I still have it. An eighth Birthday present. However, I do remember spending a lot of time reading Coarse Fishing by Kenneth Mansfield. Was particularly captivated by the chapter on carp fishing. I inherited my brothers copy of Mr Crabtree in the fifties, collected the Brooke Bond Freshwater Fish series. Later I acquired the I-Spy books and the observer series. I now have over 500 fishing books. Hi everyone, Chance to wind back nearly 60 yrs. My first book was Ditchfields Little Wonder Book no 6,"Fishing for all ages" The green printed version (the early ones were black print) 32 pages for about one shilling (5p). Heaven when your nine yrs old in yester year I could almost quote it then when asked. ! "Roach" in the HTCT series followed by "Perch" in the same series. Bought them from Browns Tackle, Manor Park in East London. I then started borrowing books from the library. My first from there was "This Fishing" by Capt.L.A.Parker (author of Roach in the HTCT series). I was completely fascinated as I only fished a couple of park lakes and descriptions of the Hampshire Avon and the techniques of trotting were like another world. Especially interesting was mention of his underwater periscope and wooden leger. I now live close to the Avon and fish waters he used to manage. But like many others my favourite book of all time is still "No Need to Lie". When I borrowed that from the library I was late in returning it as I was reading it over and over again and also admiring Reg Cooke's amazing artwork. What a classic! Next month it could be something else. Books I consistently go back too would be one of the john Wilson jobs.